"Robert Lincoln" redirects here. For other uses, see Robert Lincoln (disambiguation). Robert Todd Lincoln (August 1, 1843 – July 26, 1926) was an American politician, lawyer, and businessman. Lincoln was the first son of President Abraham Lincoln and Mary Todd Lincoln. He was born in Springfield, Illinois and graduated from Harvard College before serving on the staff of Ulysses S. Grant as a captain in the Union Army in the closing days of the American Civil War. After the war Lincoln married Mary Eunice Harlan, and they had three children together. Following completion of law school in Chicago, he built a successful law practice, and became wealthy representing corporate clients. Active in Republican politics, and a tangible symbol of his father's legacy, Robert Lincoln was often spoken of as a possible candidate for office, including the presidency, but never took steps to mount a campaign. The one office to which he was elected was town supervisor of South Chicago, which he held from 1876 to 1877; the town later became part of the city of Chicago. Lincoln accepted appointments as secretary of war in the administration of James A. Garfield, continuing under Chester A. Arthur, and as United States Ambassador to the United Kingdom (with the role then titled as "minister") in the Benjamin Harrison administration. Lincoln served as general counsel of the Pullman Palace Car Company, and after founder George Pullman died in 1897, Lincoln became the company's president. After retiring from this position in 1911, Lincoln served as chairman of the board until 1922. In Lincoln's later years he resided at homes in Washington, D.C. and Manchester, Vermont; the Manchester home, Hildene, was added to the National Register of Historic Places in 1977. In 1922, he took part in the dedication ceremonies for the Lincoln Memorial. Lincoln died at Hildene on July 26, 1926, six days before his 83rd birthday, and was buried at Arlington National Cemetery. Robert Lincoln was born in Springfield, Illinois, on August 1, 1843, to Abraham Lincoln and Mary Todd Lincoln. He had three younger brothers, Edward Baker Lincoln, William Wallace Lincoln, and Thomas "Tad" Lincoln. By the time Lincoln was born, his father had become a well-known member of the Whig political party and had previously served as a member of the state legislature for four terms. Robert Lincoln was named after his maternal grandfather. By the time his father became president of the United States, Lincoln was the only one of the president's three children to be largely on his own. He took the Harvard College entrance examination in 1859, but failed fifteen out of the sixteen subjects. He was then enrolled at Phillips Exeter Academy to further prepare for attending college, and he graduated in 1860. Admitted to Harvard College, he graduated in 1864, and was a member of the Hasty Pudding Club and the Delta Kappa Epsilon (Alpha chapter). Morris states after gaining admission to Harvard, Robert Lincoln emerged from college an "unsympathetic bore." After graduating from Harvard, Lincoln enrolled at Harvard Law School. When he initially expressed interest in the law school to his father, President Lincoln made reference to his own pleasant, but informal legal training by stating "If you do, you should learn more than I ever did, but you will never have so good a time." 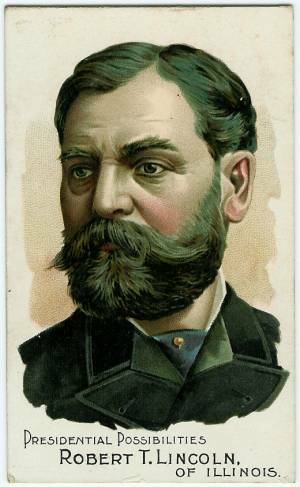 Robert Lincoln attended Harvard Law School from September 1864 to January 1865, and left in order to join the Union Army. In 1893, Harvard awarded Lincoln the honorary degree of LL.D. Much to the embarrassment of the president, Mary Todd Lincoln prevented Robert Lincoln from joining the Army until shortly before the war's conclusion. "We have lost one son, and his loss is as much as I can bear, without being called upon to make another sacrifice," Mary Todd Lincoln insisted to President Lincoln. President Lincoln argued "our son is not more dear to us than the sons of other people are to their mothers." However, Mary Todd Lincoln persisted by stating that she could not "bear to have Robert exposed to danger." In January 1865, the First Lady yielded and President Lincoln wrote Ulysses S. Grant, asking if Robert could be placed on his staff. On February 11, 1865, he was commissioned as an assistant adjutant with the rank of captain and served in the last weeks of the American Civil War as part of General Ulysses S. Grant's immediate staff, a position which sharply reduced the likelihood that he would be involved in actual combat. He was present at Appomattox when Lee surrendered. He resigned his commission on June 12, 1865, and returned to civilian life. Lincoln had a distant relationship with his father, in part because, during his formative years, Abraham Lincoln spent months on the judicial circuit. Their relationship was similar to the one Abraham Lincoln had with his own father. Lincoln recalled, "During my childhood and early youth he was almost constantly away from home, attending court or making political speeches." Robert would later say his most vivid image of his father was of packing saddlebags to prepare for his travels through Illinois. Abraham Lincoln was proud of Robert and thought him bright, but also something of a competitor. An acquaintance purportedly said, "he guessed Bob would not do better than he had." The two lacked the strong bond Lincoln had with his other sons Willie and Tad, but Robert deeply admired his father and wept openly at his deathbed. On the night of his father's death, Robert had turned down an invitation to accompany his parents to Ford's Theatre, citing fatigue after spending much of his recent time in a covered wagon at the battlefront. On April 25, 1865, Robert Lincoln wrote President Andrew Johnson requesting that he and his family be allowed to stay for two and a half weeks because his mother had told him that "she can not possibly be ready to leave here." Lincoln also acknowledged that he was aware of the "great inconvenience" that Johnson had since becoming president of the United States only a short time earlier. Following his father's assassination, in April 1865 Robert moved with his mother and his brother Tad to Chicago, where Robert completed his law studies at the Old University of Chicago law school (now the Northwestern University Pritzker School of Law). He was admitted to the bar on February 25, 1867. On January 1, 1866, Lincoln moved out of the apartment he shared with his mother and brother. He rented his own rooms in downtown Chicago to "begin to live with some degree of comfort" which he had not known when living with his family. Lincoln was licensed as an attorney in Chicago on February 22, 1867. He was certified to practice law four days later on February 26, 1867. On September 24, 1868, Lincoln married the former Mary Eunice Harlan (September 25, 1846 – March 31, 1937), daughter of Senator James Harlan and Ann Eliza Peck of Mount Pleasant, Iowa. They had two daughters and one son. In an era before air conditioning, Robert, Mary and the children would often leave hot city life behind for the cooler climate of Mt. Pleasant. During the 1880s the family would "summer" at the Harlan home. The Harlan-Lincoln home, built in 1876, still stands today. Donated by Mary Harlan Lincoln to Iowa Wesleyan College in 1907, it now serves as a museum containing a collection of artifacts from the Lincoln family and from Abraham Lincoln's presidency. In 1871, tragedy beset the family again when Lincoln's only surviving brother, Tad, died at the age of 18, leaving his mother devastated with grief. Lincoln, who was already concerned about what he thought were his mother's "spend-thrift" ways and eccentric behavior, and fearing that she was a danger to herself, arranged to have her committed to a psychiatric hospital in Batavia, Illinois in 1875. With his mother in the hospital, he was left with control of her finances. On May 20, 1875, she arrived at Bellevue Place, a private, upscale sanitarium in the Fox River Valley. Three months after being installed in Bellevue Place, Mary Lincoln engineered her escape. She smuggled letters to her lawyer, James B. Bradwell, and his wife, Myra Bradwell, who was not only her friend but also a feminist lawyer and fellow spiritualist. She also wrote to the editor of the Chicago Times, known for its sensational journalism. Soon, the public embarrassments Robert had hoped to avoid were looming, and his character and motives were in question. The director of Bellevue, who at Mary's commitment trial had assured the jury she would benefit from treatment at his facility, now in the face of potentially damaging publicity declared her well enough to go to Springfield to live with her sister as she desired. The commitment proceedings and following events led to a profound estrangement between Lincoln and his mother, and they never fully reconciled. From 1876 to 1877 Lincoln served as Town Supervisor of South Chicago, a town which was later absorbed into the city of Chicago. In 1877 he turned down President Rutherford B. Hayes' offer to appoint him Assistant Secretary of State, but later accepted an appointment as President James Garfield's Secretary of War, serving from 1881 to 1885 under Presidents Garfield and Chester A. Arthur. During his term in office, the Cincinnati Riots of 1884 broke out over a case in which a jury gave a verdict of manslaughter rather than murder in a case that many suspected was rigged. Forty-five people died during three days of rioting before U.S. troops dispatched by Lincoln reestablished calm. Following his service as Secretary of War, Lincoln helped Oscar Dudley in establishing the Illinois Industrial Training School for Boys in Norwood Park in 1887, after Dudley (a Humane Society employee) "discovered more homeless, neglected and abused boys than dogs on the city streets." The school relocated to Glenwood, Illinois in 1890 and most recently changed its name to Glenwood Academy; it first enrolled girls in 2001. Lincoln served as the U.S. minister to the United Kingdom, formally the Court of St James's, from 1889 to 1893 under President Benjamin Harrison. Lincoln's teenage son, Abraham II "Jack", died during this time in Europe. After serving as minister, Lincoln returned to private business as a lawyer. Lincoln was general counsel of the Pullman Palace Car Company under George Pullman, and was named president after Pullman's death in 1897. According to Almont Lindsey's 1942 book, The Pullman Strike, Lincoln arranged to have Pullman quietly excused from the subpoena issued for Pullman to testify in the 1895 trials of the leaders of the American Railway Union for conspiracy during the 1894 Pullman strike. Pullman hid from the deputy marshal sent to his office with the subpoena and then appeared with Lincoln to meet privately with Judge Grosscup after the jury had been dismissed. In 1911, Lincoln became chairman of the board, a position he held until 1922. A serious amateur astronomer, Lincoln constructed an observatory at his home in Manchester, Vermont, and equipped it with a refracting telescope made in 1909 by Warner & Swasey with a six-inch objective lens by John A. Brashear Co., Ltd. Lincoln's telescope and observatory still exist; it has been restored and is used by a local astronomy club. Robert Lincoln made his last public appearance at the dedication ceremony in Washington, D.C. for his father's memorial on May 30, 1922. Lincoln was also a dedicated golfer, and served as president of the Ekwanok Country Club in Manchester. Robert Lincoln was coincidentally either present or nearby when three presidential assassinations occurred. Lincoln was not present at his father's assassination. He was at the White House, and rushed to be with his parents. The president was moved to the Petersen House after the shooting, where Robert attended his father's deathbed. At President James A. Garfield's invitation, Lincoln was at the Sixth Street Train Station in Washington, D.C., when the president was shot by Charles J. Guiteau on July 2, 1881, and was an eyewitness to the event. Lincoln was serving as Garfield's Secretary of War at the time. At President William McKinley's invitation, Lincoln was at the Pan-American Exposition in Buffalo, New York, where the president was shot by Leon Czolgosz on September 6, 1901, though he was not an eyewitness to the event; he was just outside the building where the shooting occurred. Lincoln himself recognized these coincidences. He is said to have refused a later presidential invitation with the comment, "No, I'm not going, and they'd better not ask me, because there is a certain fatality about presidential functions when I am present." 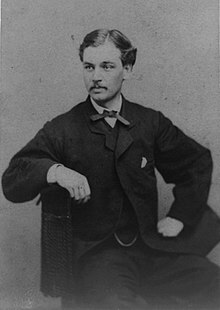 Robert Lincoln was once saved from possible serious injury or death by Edwin Booth, whose brother, John Wilkes Booth, was the assassin of Robert's father. The incident took place on a train platform in Jersey City, New Jersey. The exact date of the incident is uncertain, but it is believed to have taken place in late 1863 or early 1864, before John Wilkes Booth's assassination of President Lincoln (April 14, 1865). Months later, while serving as an officer on the staff of General Ulysses S. Grant, Robert Lincoln recalled the incident to his fellow officer, Colonel Adam Badeau, who happened to be a friend of Edwin Booth. Badeau sent a letter to Booth, complimenting the actor for his heroism. Before receiving the letter, Booth had been unaware that the man whose life he had saved on the train platform had been the president's son. The incident was said to have been of some comfort to Edwin Booth following his brother's assassination of the president. President Ulysses Grant also sent Booth a letter of gratitude for his action. From 1884 to 1912, Lincoln's name was mentioned in varying degrees of seriousness as a candidate for the Republican presidential or vice-presidential nomination. At every turn, he adamantly disavowed any interest in running and stated he would not accept either position if nominated. Robert Todd Lincoln died in his sleep at Hildene, his Vermont home, on July 26, 1926. He was 82. The cause of death was given by his physician as a "cerebral hemorrhage induced by arteriosclerosis". He was later interred in Arlington National Cemetery in a sarcophagus designed by the sculptor James Earle Fraser. He is buried with his wife, Mary, and their son, Abraham II ("Jack"), who had died in London, England, of sepsis in 1890 at the age of 16. Weeks after Jack's death, Robert wrote to his cousin Charles Edwards, "We had a long & most anxious struggle and at times had hopes of saving our boy. It would have been done if it had depended only on his own marvelous pluck & patience now that the end has come, there is a great blank in our future lives & an affliction not to be measured." Lincoln was the last surviving member of both the Garfield and Arthur Cabinets. Of Robert's children, Jessie Harlan Lincoln Beckwith (1875–1948) had two children, Mary Lincoln Beckwith ("Peggy" 1898–1975) and Robert ("Bud") Todd Lincoln Beckwith (1904–1985), neither of whom had children of their own. Robert's other daughter, Mary Todd Lincoln ("Mamie") (1869–1938) married Charles Bradley Isham in 1891. They had one son, Lincoln Isham (1892–1971), who married Leahalma Correa in 1919, but died without children. The last person known to be of direct Lincoln lineage, Robert's grandson Robert Todd Lincoln Beckwith, died in 1985. ^ Luthin, Reinhard Henry (1960). The Real Abraham Lincoln: A Complete One Volume History of His Life and Times. Englewood Cliffs: Prentice-Hall. p. 141. ^ Stevens, Walter Barlow (1998). A Reporter's Lincoln. Lincoln, NE: University of Nebraska Press. p. 261. ISBN 978-0-8032-9253-6. ^ Emerson, Jason (2012). Giant in the Shadows: The Life of Robert T. Lincoln. Carbondale, IL: Southern Illinois University. p. 79. ISBN 978-0-8093-3055-3. ^ King, Moses (1881). The Harvard Register, Volume. Cambridge, MA: Harvard College. p. 378. ^ Bell, William Gardner (1981). Secretaries of War and Secretaries of the Army. Ft. McNair, Washington, D.C.: United States Army Center of Military History. p. 88. ^ Sobel, Robert (1990). Biographical Directory of the United States Executive Branch, 1774-1989. Westport, CT: Greenwood Press. p. 234. ISBN 978-0-313-26593-8. ^ a b Goff, John S. (1968). Robert Todd Lincoln: A Man in His Own Right. University of Oklahoma Press. p. 68. ^ "Lincoln Chronology". National Park Service. ^ "Robert Todd Lincoln entry". Notable Names Database (NNDB). ^ "The Short Life of Abraham Lincoln II". The Lincoln Financial Foundation Collection. Indiana State Museum. July 28, 2014. Retrieved February 11, 2019. ^ Allt, Kate (12 February 2013). "Mt. Pleasant; the second Land of Lincoln". KTVO-TV via website. Retrieved 13 February 2013. ^ Mary Todd Lincoln's Stay at Bellevue Place. Showcase.netins.net. Retrieved on 2011-08-06. ^ Goodwin, Doris Kearns (2005-10-25). "Team of Rivals: The Political Genius of Abraham Lincoln". ISBN 1416549838. ^ Emerson, Jason (2012). Giant in the Shadows: The Life of Robert T. Lincoln. Carbondale, IL: Southern Illinois University. pp. 207–209. ISBN 978-0-8093-3055-3. ^ Donovan, Henry (March 7, 1896). "Hon. Oscar L. Dudley". Chicago Eagle. p. 4. Retrieved February 11, 2019 – via Illinois Digital Newspaper Collections. ^ "Cincinnati Courthouse Riot". Ohio History Central. Ohio Historical Society. Retrieved 2010-10-23. ^ "About Us". Glenwood Academy. Retrieved February 10, 2019. ^ a b c Schwartz, Thomas F. (Autumn 2007). "A Death in the Family : Abraham Lincoln II "Jack" (1873–1890)" (PDF). For the People. Vol. 9 no. 3. Abraham Lincoln Association. pp. 1, 4. Retrieved February 11, 2019. ^ "Lincoln's Son Dies In His Sleep At 82" (PDF). The New York Times. July 27, 1926. p. 1. Retrieved May 31, 2014. ^ Lindsey, The Pullman Strike, p. 301. ^ "Prominent Alumni ROBERT TODD LINCOLN '64". Alpha / Harvard. ^ "Robert Todd Lincoln Attends Dedication of His Father's Memorial (1922)". Ghosts of DC. Retrieved 26 January 2012. ^ "Interesting People: Robert T. Lincoln". The American Magazine. New York, NY: Phillips Publishing Company: 168. December 1, 1909. ^ Evans, Charles, Jr. (July 1, 1921). "From Caddie to Champion". Golfers Magazine. Chicago, IL: Golfers Magazine Company: 26. ^ NPS Historical Handbook: Ford's Theatre. Nps.gov (2002-12-02). Retrieved on 2011-08-06. ^ Corey, Herbert (December 10, 1921). "Assassin Would Have Failed Had Son Been at Theater with Abraham Lincoln". Lincoln Financial Foundation Collection. Retrieved November 12, 2013. ^ Franscell, Ron (2012). The Crime Buff's Guide to Outlaw Washington, DC. Globe Pequot. p. 104. ISBN 978-0-7627-8870-5. Retrieved November 12, 2013. ^ "Robert Todd Lincoln on Presidential Assassinations, 1881". Shapell Primary Sources. Shapell Manuscript Foundation. ^ O'Reilly, Bill; Zimmerman, Dwight Jon (2012). "Afterword". Lincoln's Last Days: The Shocking Assassination that Changed America Forever. Macmillan. p. 245. ISBN 978-0-8050-9676-7. ^ Peters, James Edward. Arlington National Cemetery: Shrine to America's Heroes (2nd ed.). Woodbine House. p. 126. ISBN 978-1-890627-14-0. ^ Robert Todd Lincoln: A Man In His Own Right by John S. Goff, p. 70-71. ^ Edwin Booth Saved Robert Todd Lincoln's Life. History Net. Retrieved on 2011-08-06. ^ Robert Todd Lincoln: The Perpetual Non-Candidate. Retrieved on 2011-08-06. ^ "Robert Lincoln". Abraham Lincoln Research Site. Retrieved 2009-11-18. ^ "Lincoln's Son Dies In His Sleep At 82. Robert, Last Survivor of the Emancipator's Family, Found Lifeless in Vermont Home. His Health Had Been Poor. He Left Father's Papers to the Nation, but Not to Be Examined for 21 Years". New York Times. July 27, 1926. Retrieved 2015-03-18. Robert Todd Lincoln, son and the last survivor of the family of President Lincoln, died peacefully at Hildene, his Summer home, last night. His death was discovered by a servant, who went as usual to call Mr. Lincoln to breakfast. Dr. C.M. Campbell of Manchester Centre, the family physician, declared death due to cerebral hemorrhage induced by arterio-sclerosis. 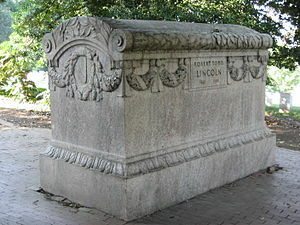 ^ Robert Todd Lincoln Tomb in Arlington Cemetery. Showcase.netins.net. Retrieved on 2011-08-06. ^ Mark E. Neely, Jr., The Abraham Lincoln Encyclopedia, McGraw-Hill Book Co., 1982 (ISBN 0-07-046145-7). Burlingame, Michael (2009). Abraham Lincoln: A Life. Johns Hopkins University Press. Charnwood, Lord (2009). Abraham Lincoln. Cosimo Classics. ISBN 978-1605207254. Emerson, Jason (2012). Giant in the Shadows: The Life of Robert T. Lincoln. Southern Illinois University Press. Graf, Leroy P. (1986). The Papers of Andrew Johnson, Volume 7: 1864–1865. Univ Tennessee Press. ISBN 978-0870494888. Morris, Jan (2001). Lincoln: A Foreigner's Quest. Da Capo Press. ISBN 978-0306810329. Roberts, Jeremy (2004). Abraham Lincoln. Presidential Leaders. Lerner Publishing Group. ISBN 978-0822508175. Wikimedia Commons has media related to Robert Todd Lincoln. "Robert Todd Lincoln". Find a Grave. Retrieved 2008-11-01. "Lincoln, Robert Todd" . Collier's New Encyclopedia. 1921. "Lincoln, Robert Todd" . The New Student's Reference Work . 1914. This page was last edited on 29 March 2019, at 20:25 (UTC).